Sage Creek Field Hockey team sprints in after celebrating with the goalie. They completed a 4-0 sweep over El Cajon Valley. 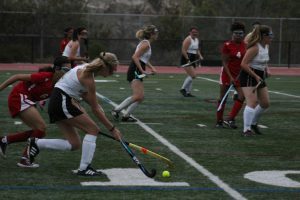 The Field Hockey Team here at Sage Creek knows no boundaries when it comes to dedication and determination, especially when going through drastic changes each year. 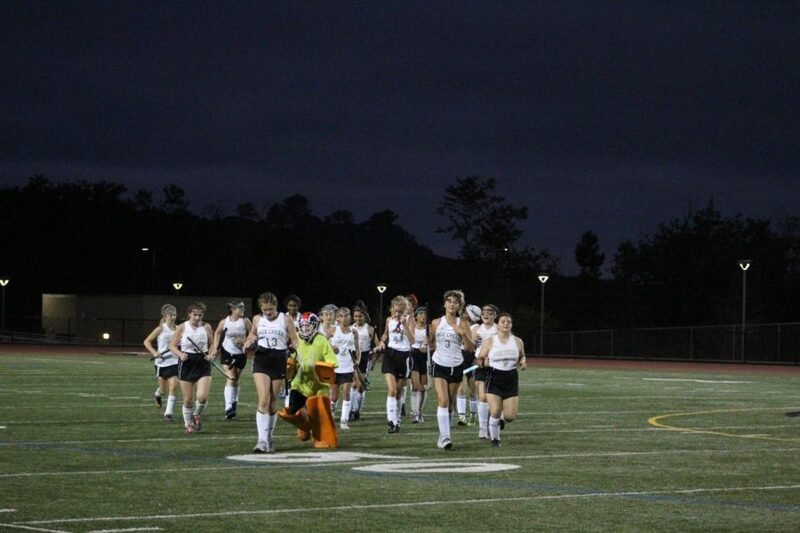 As a new sport at Sage Creek, field hockey was established in the fall of 2013. To a new school and new class, many were eager to try out the sport and see what it was all about. Led by coach Analia Loevenguth, the program grew and persevered through the 2013-15 school years. With Coach Loevenguth on maternity leave, the field hockey team was desperate for anyone to coach them. This prompted Sage Creek track and field coach Jamal Brewer to step up and take over the team from 2016-2017. While playing in a more advanced league, the team had a tougher time all around with low audiences at games, less team bonding and overall playing capabilities. Unfortunately, at the end of the season, Brewer had to step down from his position due to other work obligations. As of 2018, the field hockey team has been better than ever and are currently playing with a new enthusiasm never seen before. With new coaches Jessica Montiel and Jenna Kern, the field hockey program is advancing in multiple ways. The team is blossoming with a more interactive crowd, better playing capabilities and especially, team bonding. One of the captains of the varsity team, senior Gabby Tassinari, has been playing since her freshman year. Entering the 2018 season, she has a lot to say about the program. “Well since my first year a lot of girls weren’t as confident or comfortable… and now that the years have gone on, we finally have a soccer coach and a field hockey coach… so we have a lot of knowledge of team spacing and strategy on the field,” Tassinari says. Tassinari previously ran track and field at Calavera Hills Middle School and when arriving at Sage Creek, she decided to give Field Hockey a shot, which was a sport she had never heard of before. Through the future development of the program, much progress is looking to happen regarding team bonding. Sage Creek Field Hockey player Maddy Riley bobs and weaves past defenders. She is looking for an open lane to take a shot. Another Teammate and longtime player, senior Julia Araujo, has a very optimistic outlook on the team this year and works on perfecting her skills. “This year I’m looking forward to playing in our new league and hopefully winning some games. Also being a senior on the team is exciting and I’m excited for senior night,” Araujo says. Araujo became an athlete on the team her sophomore year because of her eagerness to play a sport here at Sage Creek. She currently loves the athleticism and idea of being on a team in high school. “I not only enjoy playing the game of field hockey but I love playing on the team with my teammates and having fun team bonding outside of school,” Araujo explains. The importance of Field Hockey here at Sage Creek enables students to have a fun and respectful team of individuals that all love to play the sport. “Overall, Field Hockey here at Sage Creek promotes for me the best way of team bonding and sportsmanship I can possibly have,” Araujo says. I LOVE SCHS FIELD HOCKEY!!! !